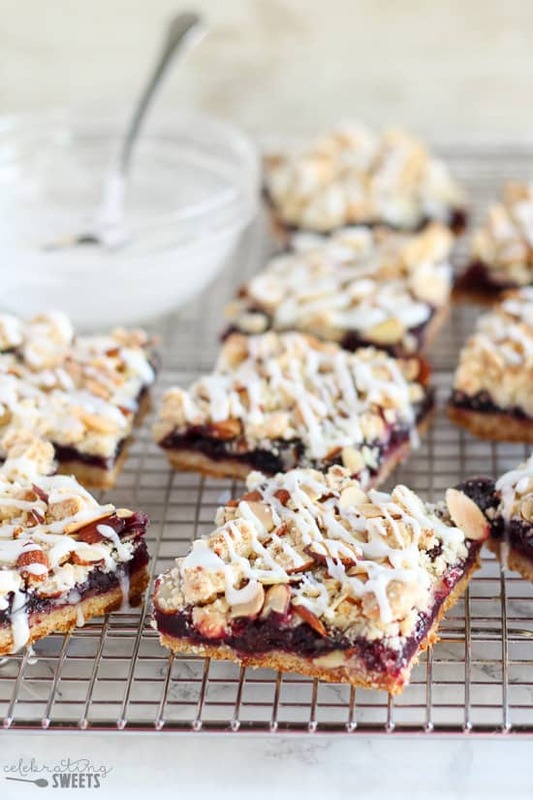 Buttery, crumbly almond bars with a sweet cherry filling. 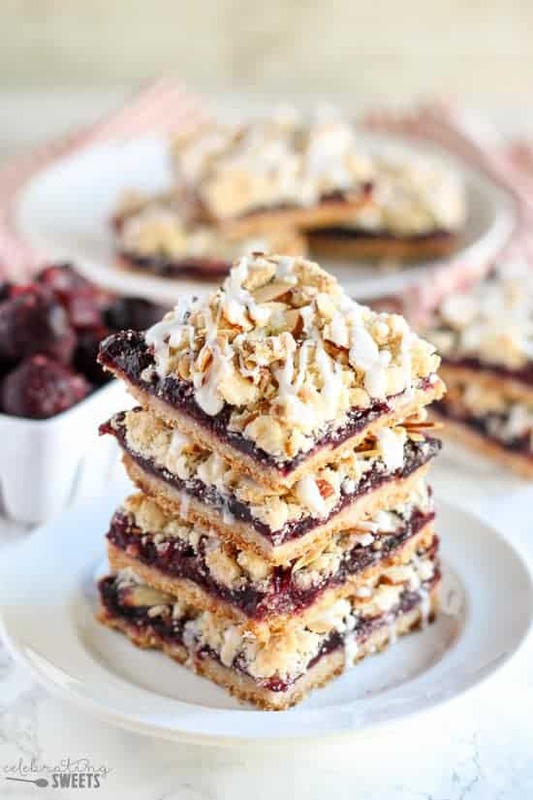 A combination of almond paste, almond extract, and sliced almonds gives these bars a deep almond flavor. This simple recipe uses the same mixture for the crust and streusel topping. 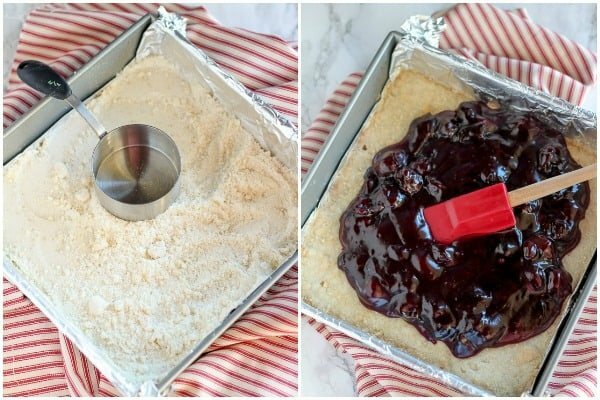 The cherry filling is made with frozen cherries, which allows this recipe to be made year round. Hello! How is your week going? The big news around here is that we finally finished decorating our house for Christmas. It took us over a week. Ugh. And not because I have any elaborate decorations but, because things didn’t go as planned (broken lights, shattered ornaments, missing cords, etc). I went to Target 5(!) separate times last week to buy/return/exchange Christmas decor. And although I love myself a trip to Target, I was just ready to be done. So, I’m happy to report that everything is decorated! Now we get to enjoy the rest of the season! 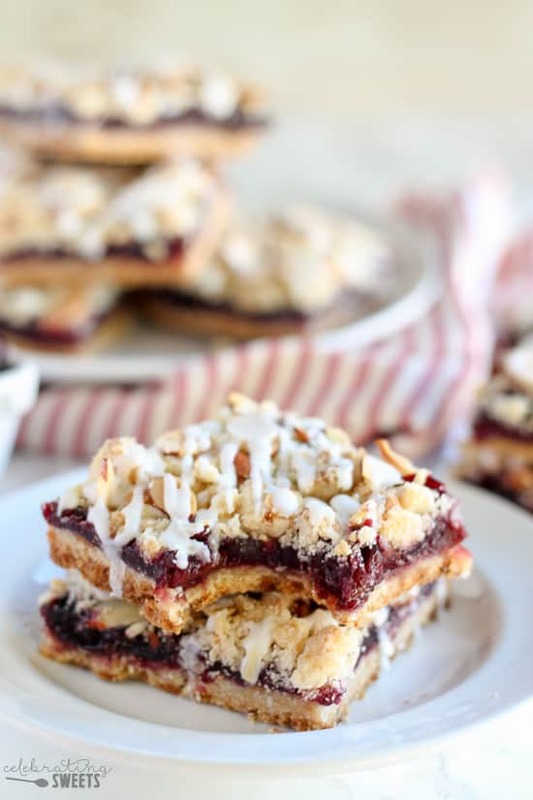 Speaking of enjoying the season, Almond Cherry Streusel Bars, anyone? Although Christmas cookies reign supreme this time of year, it’s nice to have a little variety. These bars bring it in the flavor department. The combination of almond and cherries is so darn good. These bars get a deep almond flavor from a mixture of almond paste, almond extract, and sliced almonds. The crust and topping is made from the same mixture. You press part of the mixture into the bottom of a pan and reserve some to sprinkle over the top. It’s super simple. The cherry filling is made with frozen cherries, which means these babies can be made any time of year! Score! I loved this recipe so much, I’d rank it in my personal top 5 favorite recipes on this site. Amazingly delicious! 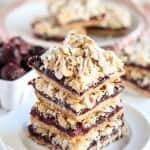 These sweet and buttery, cherry-studded bars would be a beautiful addition to your holiday table. And let’s be honest, Santa won’t argue if you leave a few out for him, too. Preheat oven to 350°F. Line a 9x9 square pan with foil and grease the pan foil. Set aside. In a large bowl, combine flour, sugar, baking powder, and salt. Add butter, almond paste, and almond extract. 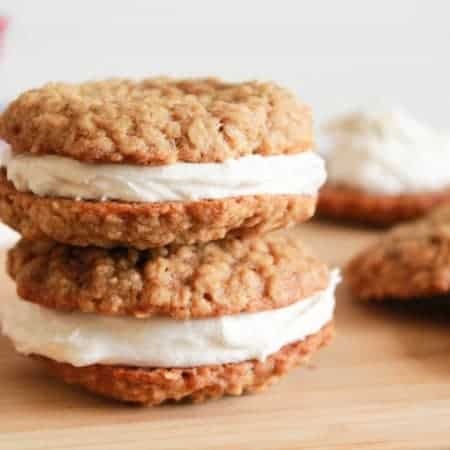 Using a stand mixer with the paddle attachment, a pastry blender, or two knives, cut the butter and almond paste into the dry ingredients until it resembles sand. Remove and reserve 1 heaping cup (for the topping). Pour the remaining mixture into the prepared pan and press it evenly over the bottom. I use the bottom of a measuring cup to help pat it into the pan. Bake for 12-15 minutes, until the edges are just beginning to brown. In a medium saucepan, combine cherries, sugar, water, cornstarch, lemon juice, butter, and salt. Bring to a simmer and simmer until thickened, about 5 minutes. Spread filling over crust. Sprinkle with reserved streusel mixture and sliced almonds. Bake until the filling is beginning to bubble and the topping is light brown, about 30 minutes. Cool completely. Whisk all icing ingredients, adding more milk or powdered sugar to reach your desired consistency. Drizzle over cooled bars (I place my icing in a ziptop bag, snip off the corner, and drizzle the icing straight from the bag). Hello, I Love your website you are so talented..I would Love to win a Kitchen Aid Mixer – this would be a dream come true..I have always wanted one searched for one however, at present I am fighting Cancer this places a stop on many things you want to purchase or do..I keep positive because there is “tomorrow” I do love to bake especially around the Holidays and all of the good memories of baking with my Mother and Grandmother who have passed are with me..I am looking forward to my Kitchen Aid Mixer one day.. Thanks for reading, Kathy. Good luck with the giveaway, and I wish you the best with your health. Happy holidays! We have a cherry tree in our garden, and i can’t wait for the summer when it starts giving fruit! These bars look and sound very delicious, i’ll have to try them. In the one picture you have them stacked four high. That seems about right for what I need. 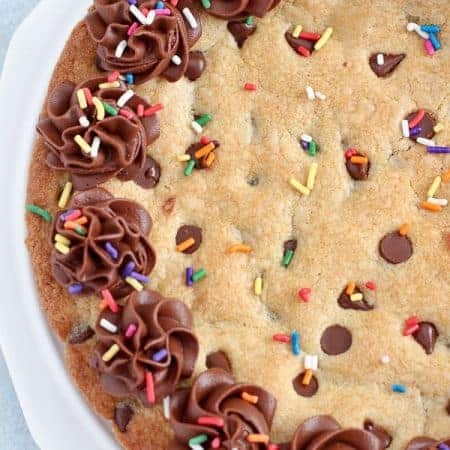 These look like such a fabulous treat. Two of my favorites in a beautiful little bar. YUM! Ohhhh I’ve been wanting to resurrect an old recipe for fruit bars, but I’m really wanting to make yours too! They’re gorgeous and easy…love that 🙂 Pinning and sharing these beauties! 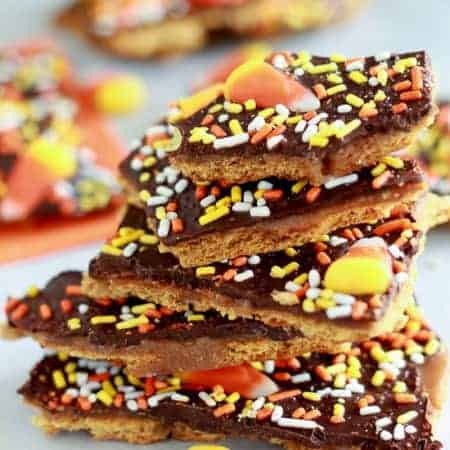 These look SO good, and I love love love that this filling is homemade but with frozen cherries so you can make it any time of year. I feel like there’s such a short window of time when you can get fresh cherries that I don’t get to enjoy my favorite cherry desserts nearly as often as I’d like!